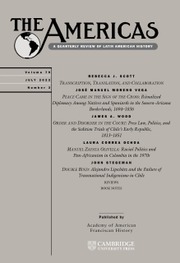 The Americas has been one of the principal English-language journals of Latin American history since 1944. Articles and reviews in history and ethnohistory about all geographical regions of the Americas and their Iberian background are included. Topics dealing with the economic, political, cultural, social, religious, diplomatic or intellectual history of Latin America, the Atlantic World, and the U.S.-Mexican Borderlands, and research that places these themes in a comparative framework, are welcome. The 2018 Tibesar Prize from the Conference on Latin American History and The Americas has been awarded to Scott Cave for his ground-breaking article (Madalena: The Entangled History of One Indigenous Floridian Woman in the Atlantic World). Read the 'best article' in The Americas from the previous year for free here!